Iwai's first interactive works were experimental animations and precinematic "toys" such as flipbooks and zoetropes. Since 1986 he has used the computer to create "visual music systems." In his early piece Well of Lights (1992), which he developed while artist-in-residence at the San Francisco Exploratorium, Iwai used computer graphics and a video projector to create several hundred animated aquatic creatures that "swim," play, and change form in an ethereal vivid blue environment that suggests both air and water. 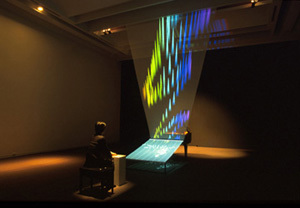 Another early piece, Music Insects (1992), merged sound and computer images to create abstract "music insects" that "react" to color dots on the computer screen. (The dots trigger musical scales, light patterns, and sounds.) The user creates a color path for the insects and random musical performances that the artist has termed "visual music." 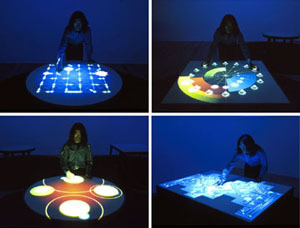 Iwai's Piano -- As Image Media (1995), [shown below] a later sound work, is related to these early interactive experiments. Here the user, seated at the piano, triggers a flow of images that depress the piano's keys; a consequence to this action releases yet another flight of images. The resulting interactive installation synthesizes two different aesthetics: sounds (simple melodies), images and a mechanical object (the piano) with digital media. A projected score and computer-generated imagery transform the piano into image media, hence the work's name. Sound is the triumphant component in these works, for it activates and shapes the visual work. But the visual aspect of Iwai's installations is lovely. His interactive systems appeal to the creative impulses of adults and children alike with their celebration of animation, computer potential, and the joy of sound.